When Farmer-to-Farmer volunteer Randy Shackelford traveled to Zambia in 2015 for his first USAID Farmer-to-Farmer assignment—and his first trip to Africa—he didn’t imagine the deep personal and professional connection he would end up making with the community in Chipata. He recently returned from his third Farmer-to-Farmer volunteer assignment in the region—part of a larger three-month trip funded by the Full Belly Project (FBP) to scale-up production of the nonprofit’s universal nut sheller, a simple hand-cranked device that curtails aflatoxin cross-contamination and significantly reduces the amount of time it takes to shell peanuts. Shackelford and FBP founder Jock Brandis introduced the universal nut sheller to Chipata farmers as part of their first assignment in September 2015, training almost 400 farmers, most of whom are women, on aflatoxin reduction and how to use the device. The nut sheller generated a lot of interest among the farmers, as did the mReader, a portable aflatoxin contamination testing kit that Shackelford and Brandis used during their first trip and conducted follow up testing with during their second assignment in early 2016. 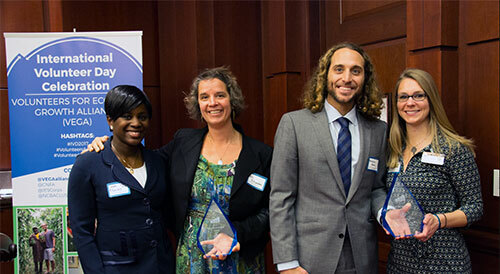 Shackelford and Brandis received the Volunteers for Economic Growth Alliance (VEGA) 2015 Volunteer of the Year award for their groundbreaking work. Since then, FBP has been raising funds for Shackelford to return to Chipata, Zambia to establish a manufacturing station. In coordination with the Chipata District Farmers Association (CDFA), and partnering with NCBA CLUSA’s Farmer-to-Farmer project, Shackelford returned to Chipata in February 2017 to scale-up nut sheller production. A temporary workstation was quickly assembled, and Shackelford hired and trained three nut sheller fabricators, one of them a young woman named Dorica who recently graduated from a local agricultural university. Over the course of three months, Shackelford and the fabricator team constructed 105 nut shellers. Shackelford was impressed by the aptitude of the fabricators; after initial training they surpassed his daily production estimates, soon outgrowing their workstation. The team participated in numerous community events to provide nut sheller demonstrations, with farmers and local and national officials recognizing the tremendous potential of the locally manufactured devices to impact the peanut industry, improve community health and improve women’s livelihoods, as peanuts are considered a “women’s crop” in Zambia. In April, Shackelford and one of the fabricators showcased the nut shellers at Agritech, an international agricultural trade expo held outside of Zambia’s capitol city Lusaka. Agricultural professionals, from small-scale farmers to commercial enterprises, attend this annual expo to meet with some of the world’s leading agricultural industry suppliers. The nut shellers were put to the test when one seed company representative asked if they could shell his largest and smallest peanuts. The nut sheller is designed to adjust to the size of the nut and indeed efficiently shelled the representative’s samples. All of the nut shellers brought to the expo were sold to seed companies. Shackelford worked with CDFA on a marketing plan for the nut shellers, and they hope to build a larger production facility in the near future. 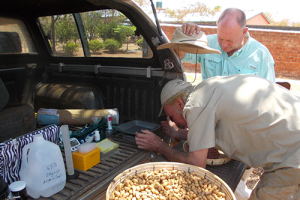 Jock Brandis and Randy Shackleford test peanut aflatoxin levels in the tailgate of their truck in Chipata, Zambia in 2015. Shackelford also caught up with Msekera Research Station staff, who have been using the mReader to conduct the quick aflatoxin tests since it was introduced to them in 2015. In fact, Msekera Research Station saw such high demand for the tests that they have purchased additional orders of testing strips to continue offering the service. What started as a single Farmer-to-Farmer volunteer assignment has turned into a larger mission for Shackelford and Full Belly Project. Shackelford’s recent trip was funded by FBP and through an NCBA CLUSA F2F assignment under ACDI/VOCA’s West Africa F2F program.